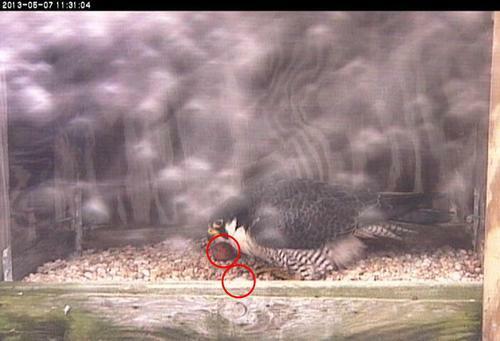 We have confirmed a second clutch of eggs for the Richmond peregrine falcons. 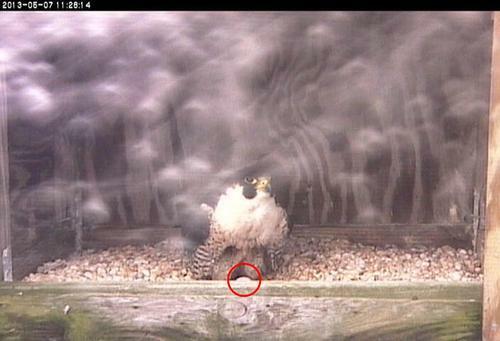 The first egg was likely laid sometime on Saturday May 4th. A second was clearly seen on May 7th. Peregrine falcons typically lay eggs two days apart. The nest scrape (depression in the gravel where the eggs are laid) is very close to the front edge of the nest box , making it difficult to see how many eggs the pair have. The birds have been incubating regularly and incubation generally starts with the penultimate (second to last) egg, although cool temeratures can cause incubation to start earlier in the process. A four egg clutch is the norm for peregrine falcons but we’ll have to wait until we get a better look to know for sure how many eggs we have.